As we come down from all the Mother's Day celebrations and begin the work week, it is important to take a moment and think about what Mother's Day really is all about. Obviously, it's a day to celebrate mothers. But what does being a "Mom" really mean? Is it just that you have a blood offspring? Is it that you take care of others? Is it that you give great advice? Make the best cookies? A great leader? Maybe just that you're a good friend? There are many types of "mothers" in the world. And not everyone will think of the same definition when hearing the word, "mother." Our concept of mother is based on our experiences in our lives. It's based on the people in our lives, and what becomes important to us. It is fantastic that there's a day out there to celebrate these amazing women. A day to pamper the people who have always pampered us. But it's also important to remember to honor these women all throughout the year as well, because where would this world be without all the amazing mothers out there? Those women that are constantly encouraging us, encouraging change, encouraging a better world. Various versions of Mother's Day have been around for centuries in all cultures. It was slowly revived in America in multiple ways. In 1858 Ann Marie Jarvis first attempted to improve sanitation through what she called "Mother's Friendship Day." She organized women throughout the Civil War to teach them the basics of nursing and sanitation, and in the process helped save thousands of lives. Julia Ward Howe (author of the "Battle Hymn of the Republic") took the idea one step farther in 1870. She was devastated by the death and carnage of the Civil War and was a great activist for peace. So she called upon all womanhood to unite together and rise against war. She wanted to protest the futility of sons killing sons of other mothers, so she created a day to celebrate peace, motherhood, and womanhood. This became an annual event falling on the second Sunday of June each year. This practice of united women against war lasted for over 10 years before dying out, but the idea of the day was not totally lost. Jarvis' daughter, Anna M. Jarvis was the woman who finally succeeded in making Mother's Day into the holiday that we are used to. After devoting her life to caring for her ailing mother, Jarvis wanted to find a way to honor her after her death. She felt that children often didn't show enough appreciation for their mothers while they were still alive. In 1907 she began a campaign to establish a national Mother's Day to honor mothers, living and dead. The first Mother's Day was observed as a religious occasion on May 10, 1908 at the Andrews Methodist Church in Grafton, West Virginia. 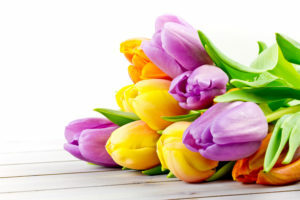 The idea quickly gained in popularity and on May 9, 1914 a Presidential proclamation declared the 2nd Sunday of May to be observed as the official Mother's Day. White carnations became the official flower of the day since those were Jarvis' mother's favorite flower. As the holiday became more and more popular through the years, so did the commercialization, much to Jarvis' dismay. She vigorously tried to fight against it, but it had gained too much momentum. Despite the commercialization, the day still stands as a day to honor Mothers, both living and dead, and to show appreciation for everything they mean in our lives. This day is a reminder to show our mothers we care. But it should also be a reminder to let them know throughout the year as well.